A New Dawn Realty is proud to serve the citizens of Stokesdale with the best in real estate services. Whether you’re looking for the perfect home in Stokesdale or you are looking to put your home on the market, A New Dawn is here to provide you with the real estate assistance that you need. Contact us today to learn more! Spring is here, and what better time to put your home on the market than now? 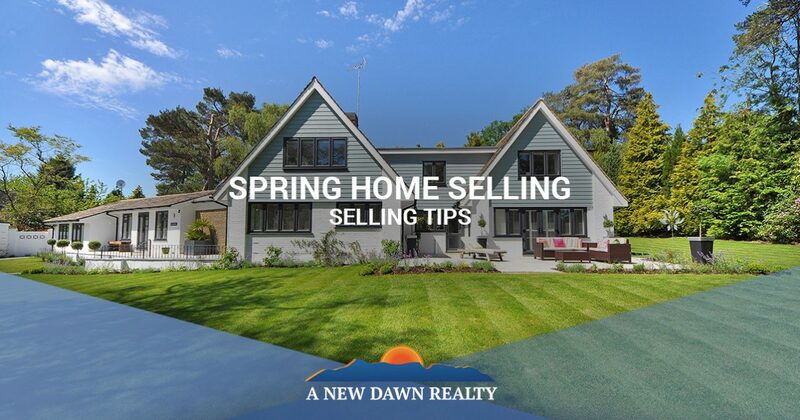 In this blog post, we’ll look at a few helpful tips to aid you in listing your home for sale this spring. One of the best parts of spring is spring cleaning. If you keep a clean home throughout the year, then the need for intensive cleaning is likely low. Even if you don’t, though, spring is as good a time as any to get rid of things that you aren’t using that are simply taking up space in your home. Not only will this free you of valuable space in your home, ridding you of unwanted clutter, but it will also make the move to your next home even easier. In addition to getting rid of things that are no longer of use to you, finding ways to store things that you aren’t currently using is another way to make space in your home as you prepare to list it for sale this spring. Clearly you won’t be needing clothes that don’t fit the season, so buying storage tubs for them and stashing them in your basement or storage space will help free up space in your closets. This will not only help give potential buyers a better idea of what the closets look like, it will also help contribute to the overall tidiness of your home, which is never a bad thing. It’s spring, and with spring comes all the beauty of the outdoors. Why not maximize this and help your home look its absolute best? Tend to your garden by planting new flowers plants, mow your lawn and clean up your yard. A little effort can go a long way in terms of curb appeal, and with the gorgeous sunshine draping over your home, you can easily make your home’s outdoor appearance more inviting, encouraging prospective buyers to see what’s inside. While there are many other things that you can do to help your home sell quickly this spring, one of the biggest things has to do with price. We’ve talked about it before, but the fact remains—the price of your home can easily be the one deal breaker for a buyer. Your home could be otherwise perfect in the eyes of the buyer, well-kept, in a fantastic location with great neighbors. If it’s priced too high, though, this could very easily discourage a buyer from even attempting to make an offer. Getting an appraisal on your end will help you determine your home’s current value, and listing it a price that is both fair to you and your potential buyer can be the thing that seals the deal. Those are just a few tips to help you sell your home this spring. A New Dawn Realty is here to help homeowners in Stokesdale sell their homes. Working with our certified real estate agents, you’ll be able to get the professional assistance and top notch service to help you sell your home in Stokesdale. To learn more about our Stokesdale real estate agency, contact a New Dawn Realty today!